The Metroidvania and Roguelite gaming scene is littered with countless titles that do the same time. Have you running up against areas of enemies, tossing in some items to help you along the way and provide you countless hours of adventure. However, Dead Cells, not only manages to accomplish but does so in a manner that I haven’t experienced quite before. It’s charming, fast-paced, frantic and manages to hit the nail on the head in just about every category. It’s quite possibly the best Metroidvania game I’ve played in a long time. While the rest of the world will be getting their hands on Dell Cells on August 7th, 2018. I’ve had access to the game ever since I saw it at PAX East 2017, which was hidden off in a corner inside of the Indie Megabooth. It was there that myself and my team laid eyes on what the French developer had pitched as a completely different experience. Having grown up on titles such as Castlevania and having a huge interest in Metroidvania titles, I gave it a spin. And then I died, over and over again. Yet I couldn’t pull myself away from the game. At some point, the developer laughed and then mentioned to me that this was their intention all along. A year later, I find myself still trying to tackle Dead Cells. Every attempt, I manage to get a bit further before being decimated by the enemies or completely slaughtered by a boss. It’s this that keeps me coming back. However, what separates Dead Cells from other games is how the game is set up and how it compels you to go just one more time. Oh, and you will go one more time. At the core of the game is a unique progression system. In a nutshell, when you play the game, you’ll encounter items that will ultimately benefit you on your multiple runs. The first being cells, which the game is named after. 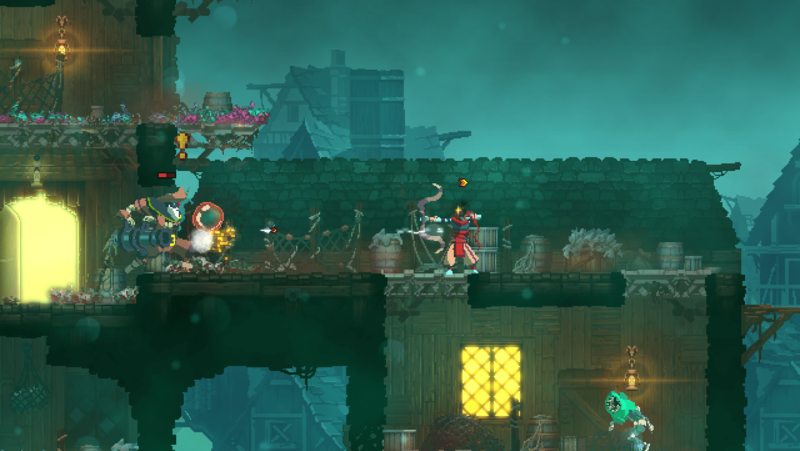 These cells drop from enemies that you kill and they aid you in your journies. You’ll use them to acquire perks, once you have accumulated enough of them and only if you make it to the safe point intact. Perks such as keeping a portion of your gold when you die, getting more healing flasks or being able to spawn with better weapons and more. You see, while permadeath is a big part of this game, it doesn’t mean the end. Instead, you’ll keep amassing cells and build a better character. So while your first time playing you may end up dying very quickly. Over time, you’ll get better, you’ll learn strategies to stay alive, you’ll figure out how to deal with enemies and you’ll have better equipment. It’s a cycle of rinse and repeat, for sure. But one that doesn’t get dull the first twenty or thirty times that you die. Think of it as the Roguelite equivalent of Ground Hog Day. The combat is equally impressive, that will have you running and dodging while jamming your sword into the skulls of all who oppose you. Fast-paced and never relenting is all I can say about this. In fact, the only time you actually have some downtime is when all the enemies have been dispatched….. or when you die. Otherwise, get ready to be swarmed, over and over. Thankfully, there’s more than enough weapons and devices available to keep you alive. Swords, knives, bows, frost bombs, frost blasts (think of Iceman) and more are scattered throughout the world. It will be up to you to decide if a certain weapon is worth picking up or bypassing. Not every weapon is right for everyone, and the strongest doesn’t mean it’s the best. So a little experimentation is required and recommended here. But what happens when you die? Well, your game is over. That’s it, lights out. You return to the start of the game and need to try again. Your items, gone. Your cells, gone. This is permadeath, and that’s the short answer. There’s no going back for your drop loot, and I rather enjoy this as it forces me to get better. There’s also a nice variety of enemy types. You have to cannon fodder enemies, enemies that track your every move, to those that will end your day by so much as looking at you. Ranged baddies, enemies so fast and deadly you’ll wonder how the hell you’re getting away from them. And then you have your “I FREAKING HATE YOU” enemies, I won’t go into detail with those. Just trust me when to say, you’ll know who they are when you see them. There’s something for everyone there, so no complaints about lack of enemies, ok? The art direction in the game is also a change of pace. Gone are the dull and drab browns, blacks and grays that we are used to. Replaced with a colorful palette of pixels, with the likes that I haven’t seen a game before. Enemies even manage to explode in a rainbow of destruction. The music accompanying each level was fitting and I enjoyed several of the tracks. I do have a problem with background music as it would stop for several seconds. The tracks don’t seem to loop properly, which surely is a minor issue. Now, you’re probably wondering, ok what’s the bad side to the game? Truth be told, there really isn’t any. The game is perfectly paced, everything is well executed and there’s really nothing here that I could say is damning by any means. But if I had to really point out anything, it would be getting to a boss and getting wrecked in seconds; which is part of the charm of the game. Learn and get better, or end up dead. Now, where’s that frying pan weapon? I can’t seem to find it. Review Disclosure Statement: This copy of Dead Cells was provided to us by Motion Twin for review purposes. For more information on how we review video games and other media/technology, please go review our Review Guideline/Scoring Policy for more info.